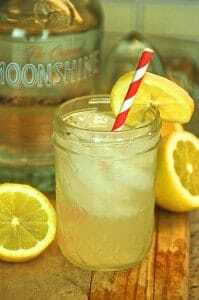 This lemonade moonshine recipe infusion gives a great spin to ordinary lemonade turning it into a tasty booze bomb. The best part – it’s really simple to make. All the ingredients can be sources at any grocery store, and making it takes about half an hour. Of course, making your own moonshine for this will take a bit longer, but it will also give you better control over the final flavor. Sure, Everclear is also an option, if you don’t have any moonshine vodka stashed away for this occasion. For those about to tart, Lemonade Moonshine salutes you! Pucker up with this Lemonade Moonshine Recipe! Add water into the pot and heat it to around 75°F. Add sugar and stir with a spoon until completely dissolved. Let the water cool to room temperature then add moonshine and lemon juice. Pour the mixture into the storage vessel or bottle it. Store in the fridge for at least a couple of days. The longer the mixture sits in maturation the more balanced the flavor gets. It may taste too tart for some depending on the lemons used, so add a bit of sugar when serving according to taste. Add some flair and bragging rights by using your own moonshine vodka for this recipe!